Many people think that tempo stresses a defense. They will blindly say that the faster we go on offense, the more stress it puts on a defense. While there is a small grain to truth to this and that a faster offense will make the defense go more plain and vanilla, I always revert back to a conversation I had with the best defensive coach I have ever met. He told me that when an offense goes with high tempo it does force him to be more basic, but it also allows him to get in a rhythm and allows the players to get a feel for the game. What he said was a million times more difficult to defend was an offense that can change their tempo. This conversation opened up a whole new world for me. The more I watched football at all levels the actual tempo was never what messed up defenses. It was when the offense changed the tempo. This take a variety of different forms. For Auburn it’s when they go into their Sugar Huddle from their normal up tempo pace. For some high school teams in my area (including us) it’s when we go to our signal word play calls. These play calls mean that the offense will get on the line, set and snap the ball as quickly as they can. This change has lead to several scores and first downs for us. The next step is how do we implement these calls. To me, the key is to base these off of your top plays. The tempo that you will want to run the play at normally means that the defense is not totally set. This can cause issues if your team is running a wrinkle to one of their base plays. But, if you are running one of your base plays, for us it’s power, the players have run the concept against a million different looks and know how to adjust to the defense wherever they are. We tend to go into a game with two to three tempo calls. This lets us have a base and two plays that work off of this play. We learned this the hard way when we went into a game with only one tempo play. While the play worked well the first couple of times, it didn’t take too long for the defense to know what we were running and to shut it down. The next week we added the counter and a no-play to our tempo calls. The effect was that we could run at tempo and exploit the defense over playing the expected call. One key element of the tempo calls is to make sure that you practice them so that your offense must adjust to them, like they would in a game. We have a period on our Monday practices where we work just colors because it lets us get lots of reps of our base plays, but we also work them during our Scout and Team times so that our players must think on their feet and get set quickly. 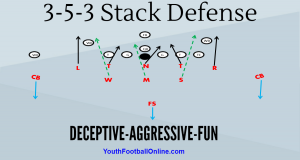 In these segments we tell our scout defense that we will be running the play quickly and they will get set in the exact same front and give the exact same look. Changing tempo is a huge way to stress the defense. Once a defense gets set in your rhythm, they can adapt to it. When a defense is really stressed is when they do not know what the tempo will be on the next play. As a result, it adds a level of stress to the players which slows them down.